Blue Hill selectman candidates Adam Gray, left, and Jim Dow discuss the issues at a March 25 forum at Blue Hill Public Library. What do voters want in a selectman? 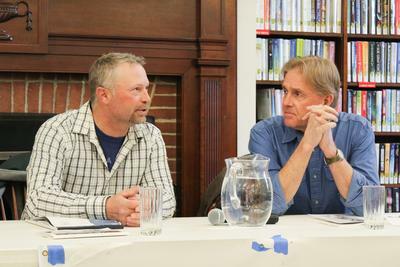 Questions asked of the two candidates, Jim Dow and Adam Gray, at a March 25 forum addressed issues such as predicted sea level rise, land use, the local commercial fishery, deferred town maintenance, and whether a town administrator is needed. The latter is up for referendum vote on April 5 when ballots will also be cast in the selectman’s race. Dow, an attorney and former executive director of Blue Hill Heritage Trust, has lived in Blue Hill for 25 years and traces his family’s local roots back to the late 1700s. Being a selectman “is a two-part job:” to manage town affairs and to bring issues before the town at town meeting. If elected, Dow said, “The job of the selectmen is to ensure good government at the local level, transparent, approachable, forward thinking….I don’t and never intend to represent one part of the community.” He later raised the idea of expanding the board of selectmen from three to five members. Little separated the two candidates in their responses, and both called for citizens not to follow the divisive national tone into an “us and them” attitude between native and non-native Blue Hill residents. “I think we can probably all agree that we’re tired of it. If we keep that stuff out of it, we’d be a better community,” Gray said. Gray stressed the importance of the local commercial fishery. He noted $6.4 million “came right here in town in 2018” in the lobster catch. “I’d say [the commercial fishery] is one of the biggest industries in Blue Hill.” The possible dredging of the Blue Hill harbor for all-tide access by fishermen and recreational users “needs to happen,” Gray said. Gray called for “maybe some accountability,” and hiring local tradespeople, citing a sub-par roof job at BHCS by an out-of-town contractor who reportedly absconded without paying for materials. “The school itself has gotten away from us,” he said. Volunteers and financial donations address issues as they arise, such as replacing the BHCS basketball hoop backboard with an adjustable one through Gray raising $3,000 “in a week,” and an outdoor program for youth developed in partnership with BHHT. On the final two questions, whether the health insurance that comes with the selectman’s position motivated them to run and whether the chamber of commerce should receive town funding, both said no. Questions came from the audience or were sent in advance to The Weekly Packet. The forum was co-sponsored by Penobscot Bay Press, publisher of The Packet, the League of Women Voters-Downeast and the Blue Hill Public Library. Nat Barrows, editor and publisher of Penobscot Bay Press newspapers, served as moderator. Voting will be held Friday, April 5, 10 a.m.-8 p.m., at town hall. 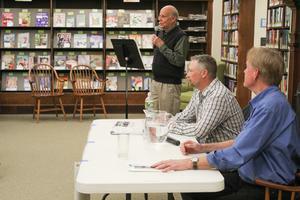 Nat Barrows serves as moderator in a March 25 forum at the Blue Hill Public Library with Adam Gray, center, and Jim Dow, at right, candidates for selectman in Blue Hill. 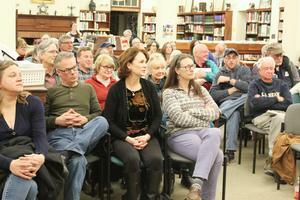 Over 75 potential voters attended a March 25 forum at the Blue Hill Public Library with Blue Hill selectman candidates.